Try this recipe created by the Craft Guild of Chefs - Chef of the year winner for 2016 Larry Jayasekara. Bring the water to the boil and add the thyme and bay leave then remove from the heat and whisk in the KNORR Professional Chicken Jelly Bouillon and salt. Allow to cool completely then pour over the pork chops, cover with cling film and chill for 1 hour. Bring the water to the boil then whisk in the KNORR Professional ChickenJelly Bouillon. Peel and diced the celeriac then sweat in the MEADOWLAND professional and add half the bouillon. Cook the celeriac until the bouillon has reduced then add the remaining bouillon. Cook until the bouillon has reduced and the celeriac is soft then lightly mash with a fork. Peel and diced the shallots the sweat in the MEADOWLAND Professional. Peel and dice the apple and add along with the bouillon and reduce by half. Add the samphire and COLMAN'S Mustard and cook for a further minute then remove from the heat. Chop the chives then add into the sauce, cover and keep hot. Rub the pork with the oil then pan fry for 3-4 minutes on each side depending on the thickness then add the masala and baste the pork until reduced and glazed. Remove, cover and allow to rest for 1-2 minutes. 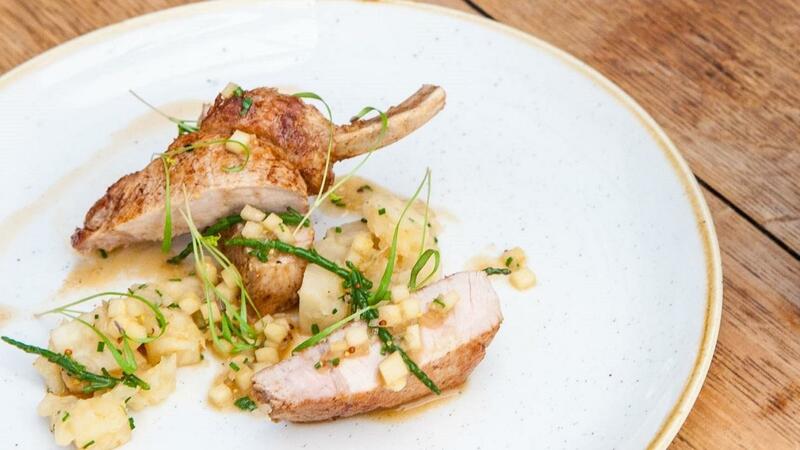 Spoon the celeriac mash on to a serving plate and sit the pork chop on top. Pour the sauce over the pork garnish with the cress.